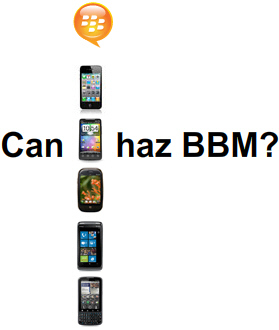 CrackBerry Poll: Should RIM make BlackBerry Messenger available to non-BlackBerry smartphones? I've had a lot of interesting conversations this week concerning Kik, the BBM-like cross platform instant messaging application available for iPhone, BlackBerry and Android. Kik is still pretty bare in features, but it's quick, uses data (not SMS) and like BlackBerry Messenger has Delivered and Read confirmation of messages. The majority of these Kik conversations have focused on two key points: one, Kik's amazing growth (upon release they went from 0 to a million users in 15 days and continue to grow) and two, the fact RIM kiked them out of App World and shut down their push service this week (see Kik's plea and RIM's official response). While the Kik success story/controversy is an interesting one to discuss, the notion that keeps coming into my head when I start talking about Kik isn't Kik itself, but rather Should Research In Motion offer BlackBerry Messenger as an app/service to other smartphone platforms? Let's think about this. The rapid growth of Kik tells me the smartphone world wants a cross-platform BBM-style messenger client. To be the category killer of cross-platform smartphone messaging clients, you need infrastructure, a solid app and a critical mass of users. If a small startup can build an app like Kik and quickly establish their brand and score some awesome growth, just imagine what RIM could accomplish with their massive infrastructure, existing BlackBerry Messenger know-how and brand recognition and global marketing reach. If they decided to go this route, it wouldn't take long for pretty much every smartphone owner to be BBMing, not just BlackBerry owners as it is now (it may not be true BBMing as BlackBerry users know it, but it would be something close enough). Who knows, BBMing could eclipse texting (SMS)! So should RIM do it? Personally, I think they should. I get the reasons why they wouldn't. RIM makes money from selling smartphones, and right now BlackBerry Messenger is one of those hooks that keeps people on BlackBerry and actually attracts some people to BlackBerry (I've heard stories from carrier reps where individuals walk into the store and ask for the phone that does BBM). But I don't think this reasoning holds up long-term. As soon as a cross-platform BBM-style client emerges in the smartphone space and attains critical mass (ie. Kik or another), even if not as fully-featured as BlackBerry Messenger the hook of BBM starts to diminish. If it's inevitable that a cross-platform BBM alternative is going to emerge down the road, is it not better for RIM to be the one who puts it out? There are some iPhone owners out there who no matter what are never going to own a BlackBerry (Apple fanboys! ), but I bet those same people would rock BlackBerry Messenger on their iPhone. Anyways... it's something to ponder. Vote on our poll above and let us know what you think in the comments!